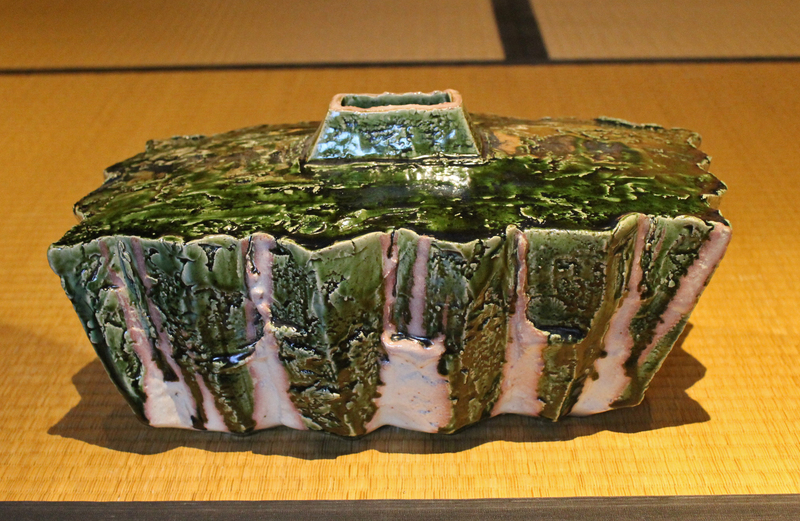 Seto potter Kouchi Hidetoshi (b.1960) is a gallery favorite for his innovative, dynamic designs and glazing, breathing new life into old styles. He recently brought over some new work, our first to offer in two years. 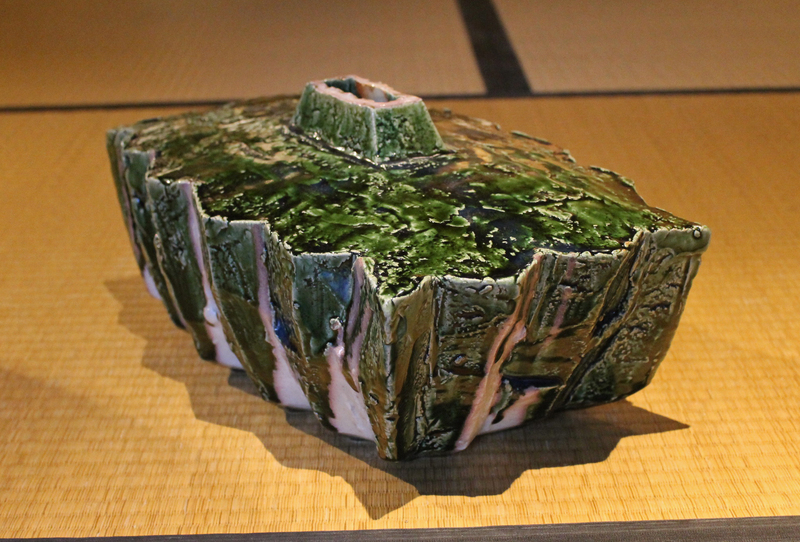 Kouchi drags a piece of wood, like a flat stick, over the raw clay form to create the rugged textures. His Oribe is original, and it’s interesting to note that he invented this effect by “mistake”. 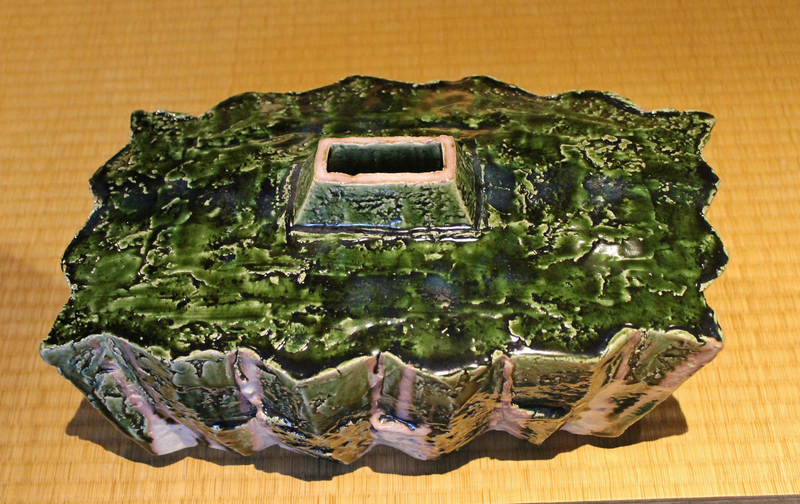 As his mentor Kato Shuntei and other potters of his generation were making very “quiet” Oribe, Kouchi was compelled to make “Oribe with movement”. 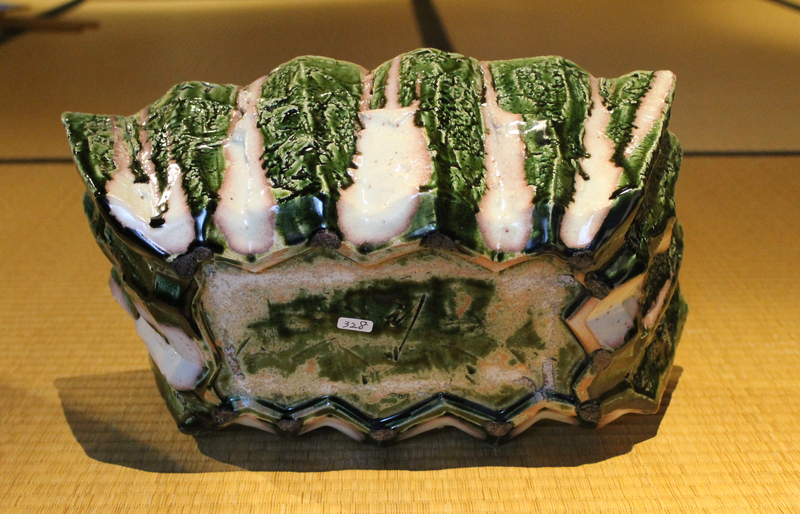 Not only is his Oribe rich, he pours Shino-esque feldspar glaze over the pieces, thus making a unique contrast between green, white, and pinkish tones in his work -indeed, original. 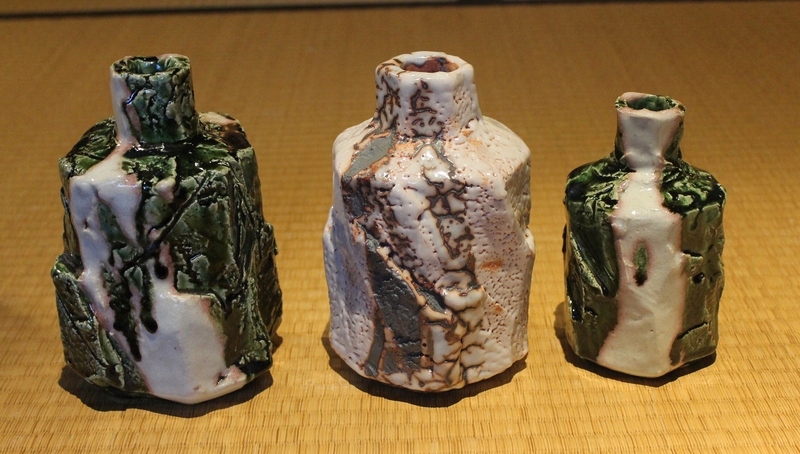 Kouchi spends about a day and a half on each piece, and fires through skilled use of his gas kiln. 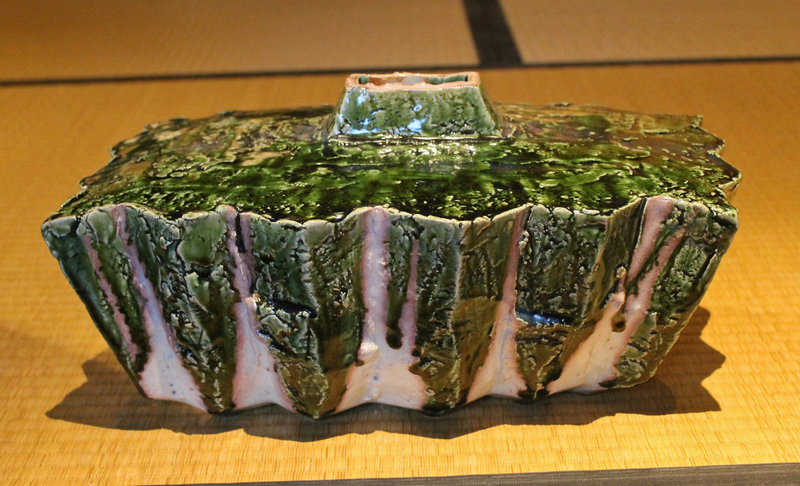 One should note that it is not only his glazing that is unique: his forms, as well, are bold and sculptural, while still retaining great sense of balance and design. Kouchi’s bio in a nutshell goes like this: Born in Aichi Prefecture;1977-Seto Industrial Vocational Training School; 1977-Apprenticed to Kato Shuntei; 1981-Seto Ceramic Industrial School; 1985-Graduated from Osaka University of Arts; 1987- Apprenticed to Shimada Koichi; 1991-Became Independent and established kiln. 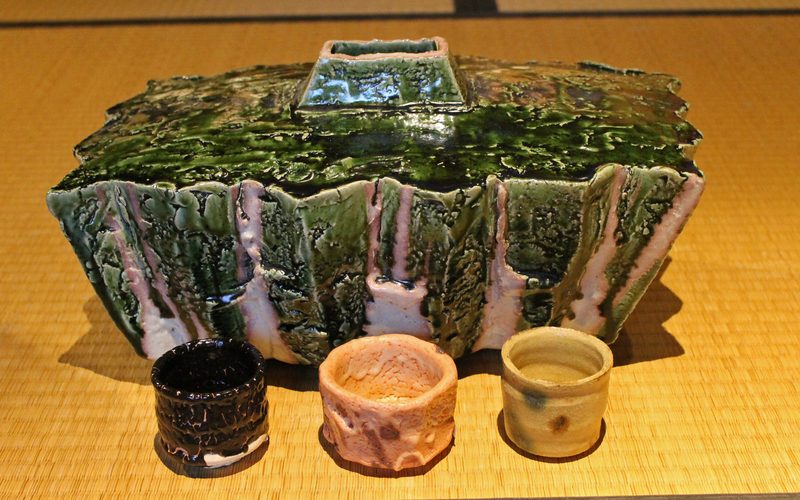 Since then he’s exhibited at Matsuzakaya, Ginza Takashimaya, Gifu Teiyokai group exhibition Gallery Akane, Gallery Anri, Gallery Sumi, Gallery Sano, Matsuzakaya Shizuoka, Mitsukoshi Hoshigaoka, and Tobu Ikebukuro. 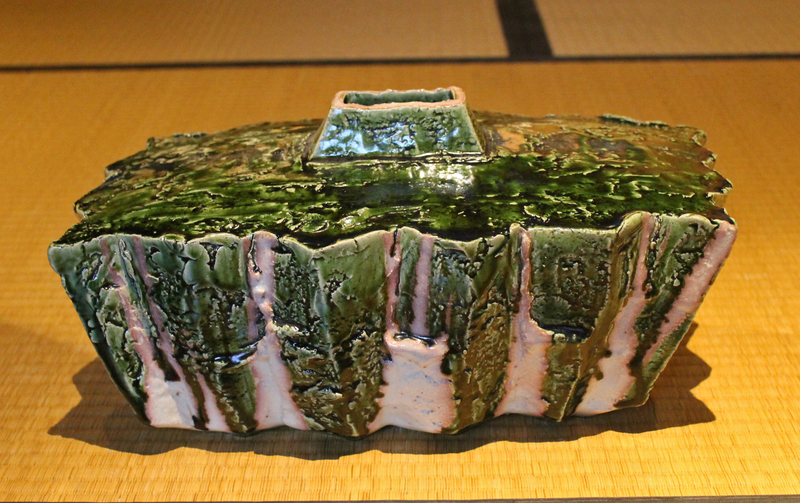 This work is 29.1cm.tallx40cm.x24.5, signed on base and with a signed box. Price: 230,000 yen EMS incl.